It’s always been somewhat puzzling to me that my admittedly small sample of truly appalling data visualization have been from largely right-wing sources: The Economist, and the Laffer Curve. The Laffer Curve particularly is an insult to anyone who has ever fit a line to data, and would just be sad if it wasn’t still being used as the basis for arguments about the tax code. Bad graph is bad. One reason is graphical, the other philosophical. And there we go. Note this tells a very different story than the graph above. Admittedly, not one that yields a nice per-party trend. Sorry. President Jones increases the national debt by a trillion dollars to construct a massive golden likeness of himself, visible not only from space by the surface of Mars. President Smith increases the national debt by a trillion and a half dollars. To fund research that manages to cure AIDS, Cancer and morning breath. Is President Smith a worse president? Has he done more harm to the country by putting us more deeply into debt? By making no attempt to distinguish good debt (say, the kind spent getting the country out of a recession, curing disease or saving puppies) from bad debt (unnecessary wars in Somewherestan, massive golden statues) and going by head-to-head amounts, the Left has essentially ceded the argument that debt may sometimes be useful to the Right. Which, if many of your platforms are based on debt and spending – or you believe Keynes may have had a point – seems to be a failing position to start from. Isn’t enough major problem with that graph that the x-scale is not constant? It’s comparing four years of Bush I to right years of Bush II, Reagan and Clinton but just two years of Obama. It is indeed another problem with the graph – it’s just a bad data visualization all around. 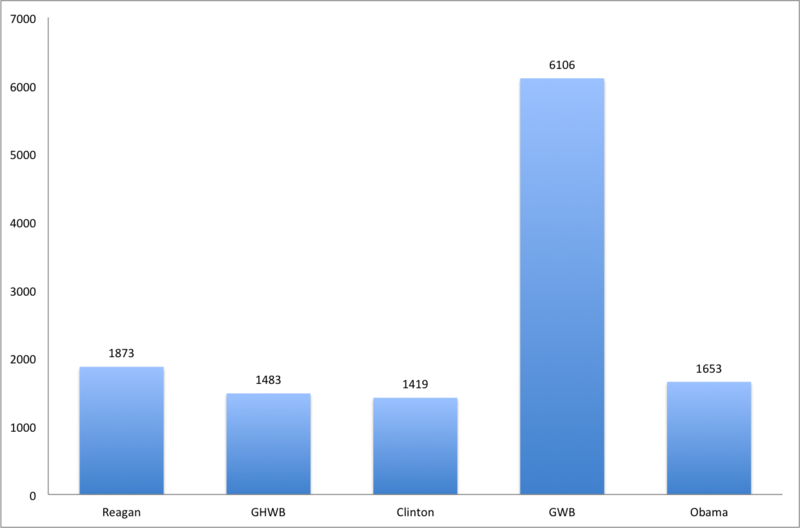 It’s not one I fixed in my example, because people often think of a presidency as a discrete unit, even if George W. Bush has twice as long to rack up debt as his father, and President Obama has had less time than all of them at this point.